Proud FLEGA member Dirk Van Welden aka I-Illusions (you might know him from the experimental and absolutely gorgeous looking platformer Element4l) is once again making big waves worldwide. His latest creation, Space Pirate Trainer, was one of the dozen games that Valve showcased at a very exclusive preview event for the HTC Vive in Seattle. A great honour in itself, but that’s not all: Space Pirate Trainer was praised by many high-profile media outlets as one of the best games at the show. We at FLEGA had the chance to play the game ourselves recently and can confirm that it’s an awesome experience. You have to try it for yourself to truly understand the appeal (screenshots and videos really don’t do it justice), but you could describe it as Space Invaders (look it up young readers) for the VR generation. 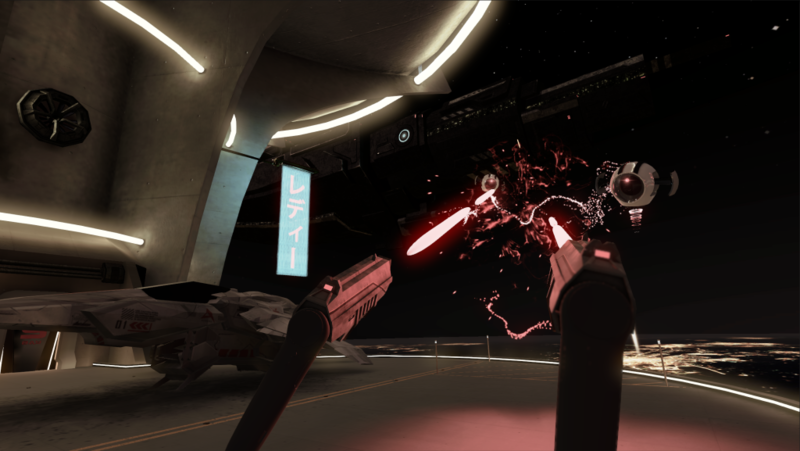 The game makes full use of room scale VR and tracked controllers, which basically means that you are able to duck, lean and move around to avoid being hit and dual-wield your morphing pistols (they have different firing modes) like Han Solo in his younger years if he would have had two guns to begin with. One of the coolest features of the game is the ability to (literally) grab a power shield on your back to block incoming shots from the alien robots that are attacking you. At its core Space Pirate Trainer is a very simple game, but that’s exactly what makes it so great. There is no need for a tutorial, you immediately know what’s expected of you and start living the universal dream of being a true space pirate. You don’t have to take our word for it, by the way. If you are one of the lucky few that have a Vive, you can try out the game on Steam right now. If not, you can read much more about the game all around the web. To Dirk’s (and our) delight the game was also featured on the homepage of Polygon.com, one of the biggest (and best) dedicated gaming websites in the world.